Menzie's club coach Mark Aston (who is also the Ireland coach) thinks he has earned a place in the PNG squad. Menzie Yere’s form this season should earn him a place in Papua New Guinea’s squad for the Rugby League World Cup says rival international coach Mark Aston. The powerful centre can win games on his own says Aston who is head coach of Ireland and Yere’s club team Sheffield Eagles. Yere is having his best season for Sheffield Eagles who lead the Championship – the second tier competition in the UK professional game. He has set a new club individual try-scoring record with 38 and his career total for Sheffield is 110 only four behind the mark set by Daryl Powell between 1984-95. Four Nations three years later earned him the nickname ‘Jukebox’ – because he has all the big hits. He joined the Sheffield club in 2009 and faces competition for a place in the PNG squad for this year’s competition from players plying their trade in Australia. “Menzie did enough to get in the squad in 2008 and I think he’s got better,” said Aston “He’s back to his best. He’s scoring more tries and he’s playing at a higher level. He’s stronger, more mature. “Menzie would certainly be given an opportunity to be in the Ireland squad. What we are looking for at Ireland is that person that can do something different – that’s what all the nations, even those with the riches of the NRL or Super League are looking for. The Rugby League World Cup 2013 kicks off at the Millennium Stadium in Cardiff, on Saturday October 26, with matches played in England, Wales, Ireland and France. 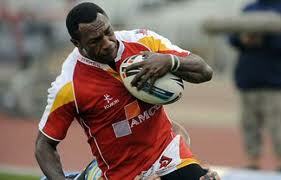 PNG are in Group B and will face the holders New Zealand, Samoa and France.